My friend Sascha has invited me to his local: “The beer here is good and I’d like to hear what you think,” he said. Old Town Pizza, here I come! The layout of this place is weird; balconies that are unconnected from other balconies, nooks and crannies connected via narrow doorways or walls that have clearly been moved to make space for people. It’s obvious that this used to be someplace else, maybe even two someplaces but what the hell it was I couldn’t tell you. Yet, here I am with their Sun Dazed Kolsch. This beer tastes exactly what it’s supposed to taste like; it’s crisp and light with a bready note on the finish, the nose a little funky, like yeast on pizza dough rising. There’s a little nudge of lemon on the finish too, shouldering its way onto my palate like a child insisting on getting dessert. It’s a damn fine kolsch and I am enjoying it a whole bunch. OTB may have stepped up their game lately. It’s been awhile since I’ve been here and I don’t remember the beer being this good. Sitting here is unusual. It feels like the other people here have earned their space here already, familiar gnomes carving their place out of the social rock. I’m at someone else’s local, a newbie who found a used cave and sat down. I don’t feel unwelcome but it’s pretty clear that the attention is rightly on the patrons behind me, waiting for crispy slices and that the regulars on the rail all have a relationship. I haven’t felt like there was a community at the rail in a few stops. It’s nice to experience. I’m taking the next week off, because I’ll be visiting family for the holiday. I hope everyone has a safe & pleasant Thanksgiving! 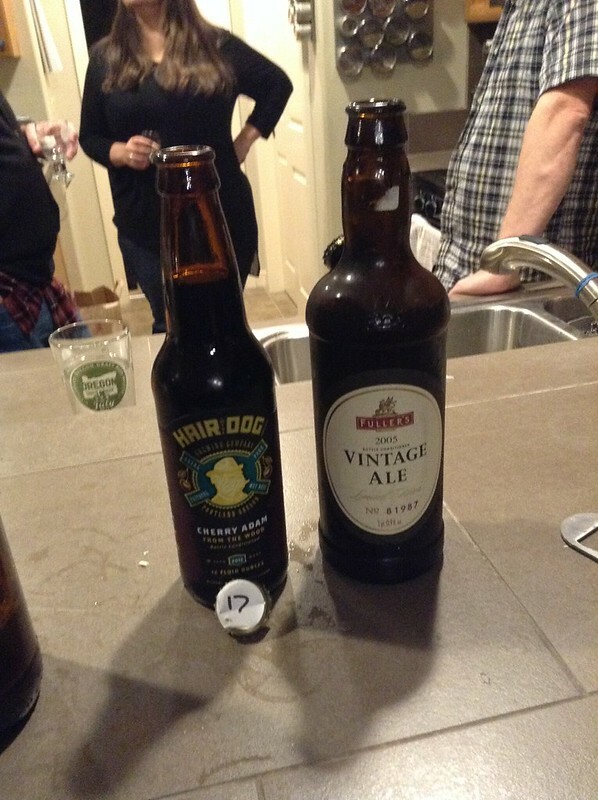 Some friends have refrigerator filled with interesting beers from years past. They’ve been collecting for a very long time and are beer people of the first order, so the collection has become pretty extensive. Truthfully, I’m underselling it: the fridge is stuffed, bottles and cans in every possible nook of the thing and they decided it was time to make some space. So they invited a bunch of people over to try some beers they’d pulled out…mostly, I think, so they could make room for more beer. I ain’t judging, because it allowed me to take notes on a whole bunch of stuff that I would never have tried otherwise. So I present my mildly edited notes. Where I could find out the year of the beer, I added that in. Final word: if some of these notes don’t seem very detailed, that’s because I had 2 ounces or less of each beer. Readers may notice that there are a lot of beers listed and drinking so little not only allowed there to be enough beer for everyone (there were roughly twelve of us), it allowed me to be sober when I left the building. 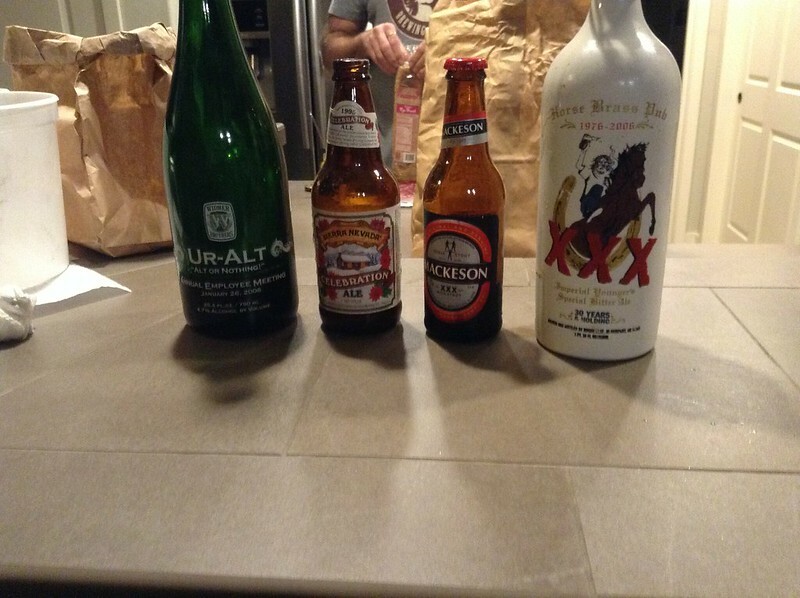 What it didn’t allow for was an in depth examination of the beer. But that’s OK. (Some corrections have been made as the hosts gave me new information). Sierra Nevada 1995 Celebration: liquid caramel. Just a tasty, smooth beer, warm going down, raisin in the nose like a sun-ripened beer but in a good way, instead of what typically happens when sun hits beer. Widmer Ur-Alt, 2006: nose is flat and I don’t get much off this, faint raisin liquor scent. The flavor has a bit more papery not very full. Not digging this one. Mackeson triple stout: this also doesn’t have much nose but it tastes like a chocolate soda. This is a compliment; the beer isn’t too sweet by any means but the bubbly finish really makes me think of cream soda. Rogue Horse Brass 30th Anniversary Ale, Imperial Bitter 2006. This one is definitely weird. Thin mouthfeel but the flavor tends toward vinous. Something leaning towards tartness, especially on the finish. Which is really weird! Do I like it? I want a little more to find out. Hair of the Dog Michael 2009: flanders red ale. It fizzes in my mouth like a sweet tart candy and it tastes like one too. Which puts it dead in my alleyway for sour beer I like. It’s brighter than the Dutchesse but this is the first HotD beer I’ve had in a long time that I have really enjoyed. Hopworks Muscles from Brussels: I’m told this is from the 2011 Belgian Beer fest. I’m OK with this. I can’t tell you why-it’s warming going down but it’s a bit too sweet as well. I don’t want to have more, yet I don’t hate it. Burnside White Out 2012; this has been stored in port barrels and whoa, it shows. There’s a bit of woodyness on the finish and this beer is one I want to filch more of. Terminal Gravity Festivale 2008: I’m scraping this off the top of my mouth and something just has gone awry. Hellshire barleywine aged in bourbon barrels: the finish here is a severe right turn into sandpaper abrasiveness. Roots Epic Ale 2008: chocolatey nose, which is good since there’s an inch of foam for me to sniff at while I wait for the beer to settle. The flavors are complex all the way to the end, chocolate, dryness, but it tastes oxidized and old. Just not quite working for me. 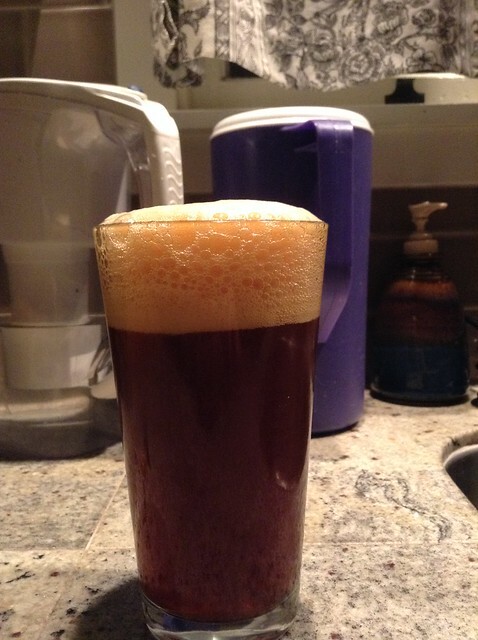 Portland brewing Bobby Dazzler Holiday ale: this is better than the Rogue Brewer but….that’s not saying much. Cardboard & chocolate. Rogue Brewer ale 2006: it’s going sour. It isn’t meant to be sour. So. No, nobody should do this. It’s bad. Deschutes Abyss 2013: cocoa powder in alcohol form. Stone Vertical 2007: This is wonderful. Everyone is focused on the Abyss, but this beer has some caramel notes that give way to some fruity ones, like a pineapple sauce over caramel. Gimme more of this if I can have it. HotD Cherry Adam from the Wood, 2012: It’s got cherry in it, alright and is pleasantly syrupy. The cherry is a definite plus because without it I think this beer would be too sweet for me. But as it is, this is a really nice post-dinner beer, the kind your parents would sit down and drink with their friends, pretense of class in their postures. Fullers vintage 2005: Hint of red wine grape in the nose. That flavor carries the day in the mouth, too and then it finishes fizzy. So; red wine spritzer? Deschutes Mirror Mirror 2009: Some bready nose and some good caramel front but the finish I’m just not certain about. It’s offputting, dry paper texture in my mouth leftover, I don’t want more of this. Sad. Rapture Olde Ritual brown ale. Has a slightly funky lagerish nose. But the beer is…my Dad would really like this. Sweetly tipped coffee, light on the tongue and very drinkable. 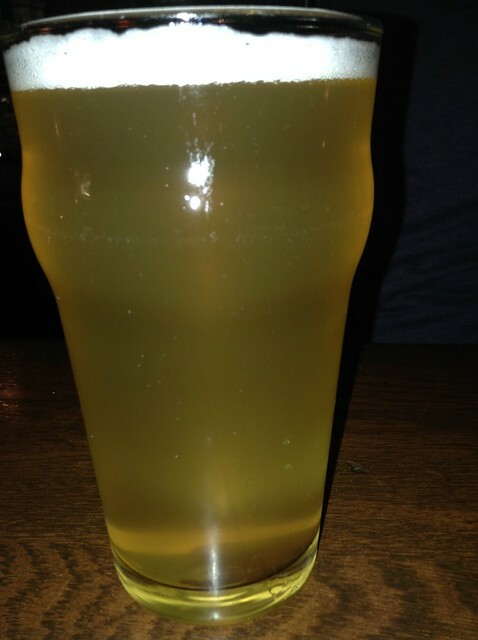 Breakside-Apollo & Dionsyus: saison aged in gin barrels. Oh, the pine that slides in at the end of this beer, following the path of some nice flowery flavors. Man. It’s good. Refreshing! In a way that a crisp lager is on a hot day. 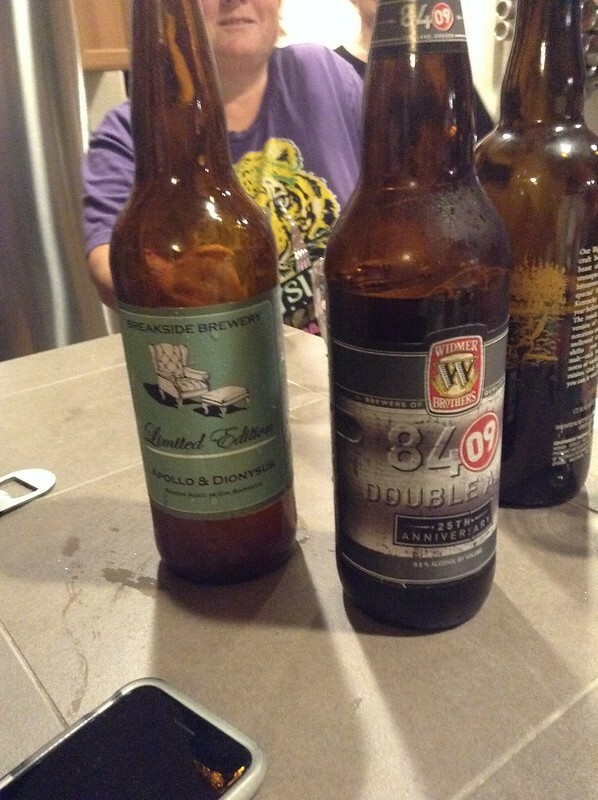 Widmer 84 09 double alt: “It’s a carmel bomb” one of the guests says. He’s not wrong. It’s light though, not sticky dense and there is a rabbit punch of bitterness at the end to keep it from being all sweet all the time. And there it is! Special thanks to the hosts of the McPolanders Tap Room, Jenn and Jeremie. They were great hosts. I didn’t even have to ask Alaksan brewing what their best selling ale was: they tell me on their web site that the Amber ale is their flagship. Problem solved! Plus, I even get to save some money for once, because the Amber is available in a handy 22oz bottle instead of having to buy a six pack. But buying a six pack wouldn’t be so bad. Caramel in the nose! That’s pretty exciting because it’s not hoppy. That this kind of variety exists at a grocery store is kind of remarkable. The caramel flavor is right there in the middle too; a roasty caramel flavor, sweet but not cloy. The finish is very bright; the bubbles are adept at sweeping nearly everything away. Nearly. After it’s all done, I’m noticing a biscuit flavor, just a little bit. The label says it’s an alt style and when I look at the style guidelines, it’s suggested that there should be an assertive hop bitterness but I’m not getting that at all. I’m not complaining by any means. 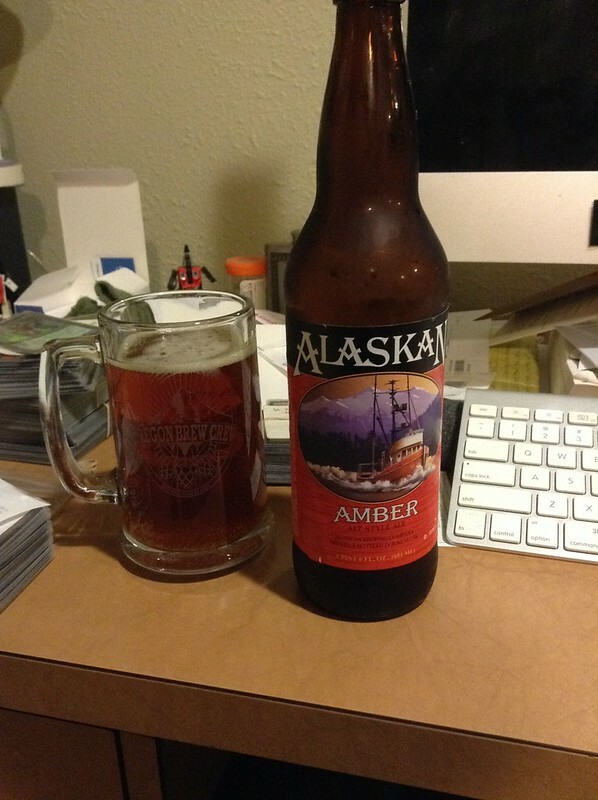 This beer probably a “take” on the style and what the brewers at Alaskan did to this beer I can’t say. But it retains it’s crisp finish (with biscuit) all the way to the end of the glass and I really see this beer as a great staple to the pub. There’s enough going on that I can drink it by itself but also nothing wrong with pairing this up with some nachos. That isn’t the fault of anyone else but me but when I got the blend of ales, in this case a mix between the barleywine and their India Session Ale, instead of one or the other, I got a beer that wasn’t bad but left me unable to really evaluate it properly. I should’ve had the chocolate then the peanut butter, before trying the Reese’s if you get my drift. Because while I didn’t dislike the drink, it didn’t blow me away. The problem is that I don’t know if this ale is greater than the sum of its parts, if it is a idea that shouldn’t have come around, or if it’s just something that doesn’t work for me. I’m going to spin this as a positive though: Now I have a reason to come back! 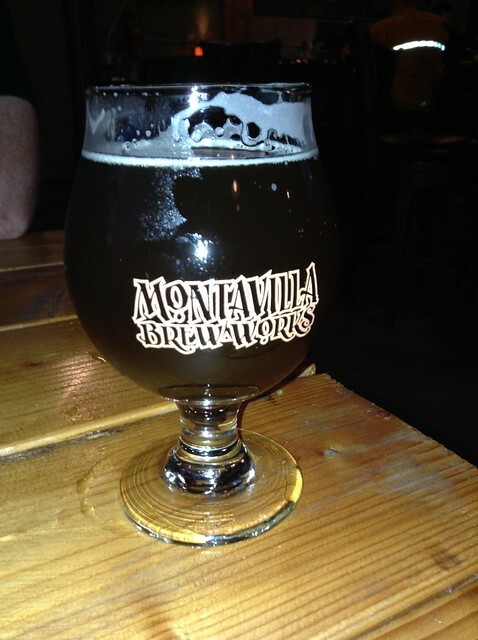 There are, surprisingly, very few brewpubs in the middle-outer SE area. And since I live out here, I naturally think there ought to be more of them. Tonight, I’m not alone; my friends Daniel and Miranda have joined me, and they seem to be enjoying their respective brown and IPA ales. This is a good sign and it means that it may not be difficult to suggest a revisit, either to myself (sometimes I need convincing) or for others (because sometimes company is nice). What was less wise of me was to say that Breaking Bad was an awful show. I know, I know; but I don’t care. It’s a extremely well crafted show that is about a terrible person who gets worse and over the course of season one throws away all the goodwill it generates towards its central character. There are no dramatic stakes because there is no actual downfall. It’s just a bad person doing terrible things and from the get-go, you know that’s what it’s going to be. The ensuing debate is lively. That’s what pubs ought to have: lively debate. It just didn’t have a proper evaluation of beer. Maybe I need to forgo the addition of bottling sugar entirely? I just don’t know at this point. But as you can see, there is a rather thick, persistent head on this beer that has a tendency to make drinking it rather difficult. On the other hand, once I can get this beer in my mouth, it’s…a little one dimensional. The nose isn’t very prominent (despite adding hops to secondary) and while there is enough malt to provide some body to the beer, the bitterness at the end is quite strong and definitely blows out the rest of the ale. It isn’t a bad beer and I don’t want that to be the impression that I’m leaving you with. I’m disappointed that I missed the mark (I was hoping for something that had some traditional IPA scents) but I’m pleased that I have a drinkable brew. I do think it’s pretty cool that yeast is being sent into space for scientific research. And it’s also cool that liquor is going up, for research, of course. Food is something people really like and having decent food for missions to Mars or long term Moon stays is pretty important! However, I’ve had Ardbeg whiskey. It tastes like something that’s been filtered through the ashes of my dead self, then sent back in time so I can drink it. In a good way. As starting point for flavor, though, I’m just not convinced that Ardbeg is where you begin. However, I am not a scientist. I should come Bailey’s on an early Sunday more often. It’s not too crowded, the music is jazzy (which is a nice change up from hip hop) and it’s bright enough that I am getting a pleasant change of pace from my usual nighttime drinking vibe. 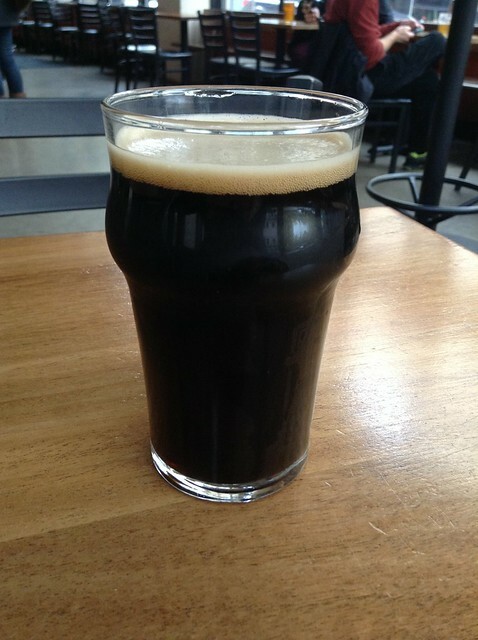 I went with the Chetco imperial coconut porter because I’d never heard of Chetco brewing and this coconut porter is…not bad. The coconut is there; sweet and definitely present in the finish. 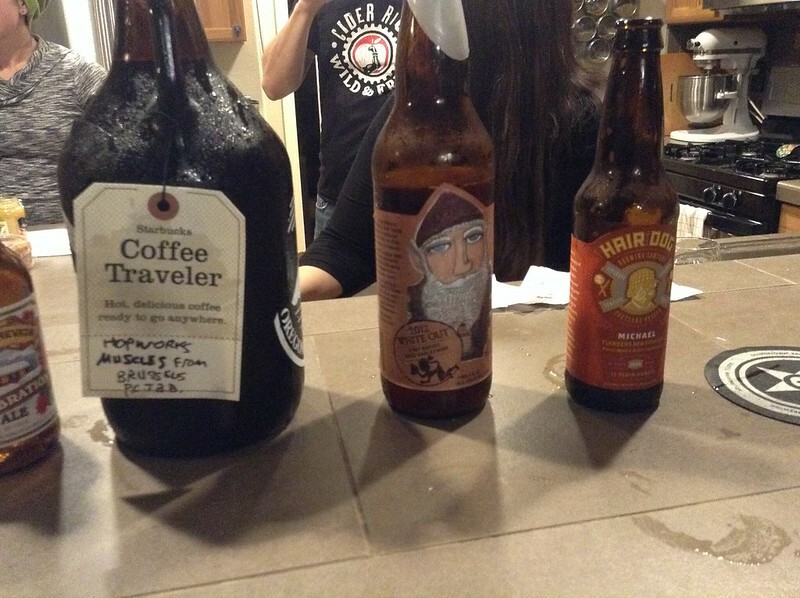 The chocolate elements are there though, and this beer isn’t too weighty on the tongue so it’s working so far. Unfortunately, as it warms up the coconut starts to become more pressing on the taste buds and that is less appealing to me. I only have myself to blame though: I knew the risks. On the other hand, I was wise enough to have a small glass of this porter, so I can afford another glass of something else. Sometimes, it pays to drink small.